In the heart of the Dorset downs, the village of Sydling St Nicholas nestles in the valley of the Sydling Water. It lies in an area which is still largely agricultural but it is now home to many incomers as well as long-rooted village families. Sydling village straggles along the Water with tiny connecting bridges to the ancient cottages which line the banks, with walls covered with clematis and roses. Never the largest of villages, with a population of about four hundred, it has nevertheless had a varied and interesting history in the transport field, with two operators providing bus services for many years. And it was in the upper Sydling valley that the hero of Geoffrey Household's 1939 spy novel Rogue Male eluded the police pursuing him before escaping by way of Cattistock within hearing of the famed carillion of the church of St Peter and St Paul. Crabb and Lovell were the two operators who ran post-war over the same route from Sydling at more or less the same times on the same two days a week for the Wednesday and Saturday markets in the county town of Dorchester. But to start at the beginning. There were of course horse drawn conveyances in the earlier years, but in the motor age Sydling village was served by two bus services, one originally run by the Terrell family, the other by the Crabbs. Although in competition, each had their own passengers and did not generally intrude on the other service. Like many other villagers Sydling people always used their favoured bus and never ventured on to the rival. James (Jimmy) Crabb was born in 1883 at Loscombe near Beaminster in Dorset. Theirs was a farming family and they moved to Sydling St. Nicholas. They lived at South View in the village and by 1915 the 32-year old Jimmy was running a carrier service to and from Dorchester on Wednesdays and Saturdays using a horse and van. This went to the Plume of Feathers in the county town, an inn used by several carriers. At this time he competed with fellow parishioner Frank Terrell, as well as the several other carriers who ran out of Dorchester along the main road to places such as Maiden Newton and Cattistock. Among the latter was Jack Record who had an old-established service from his home village of Rampisham, then through Cattistock and Maiden Newton to the county town. He also used the Plume of Feathers as his Dorchester terminus, and in August 1918 James Crabb married 23-year old Nellie Record, the daughter of the Rampisham carrier. The Crabb business grew with the first motor vehicle arriving in March 1923. This was PR256, one of the very popular Model T Fords, and it carried a dual purpose van body with windows in the sides and a luggage rack on the roof. This is where Albert (Albie) Lovell enters the story. He was born in1901 in Sydling and on leaving school he had gone to work on South View farm for the Crabb family. He then became the driver of the motor bus. (Jimmy never learned to drive although a motor bus proprietor). Albie was to work for the Crabbs for thirty three years before striking out on his own. 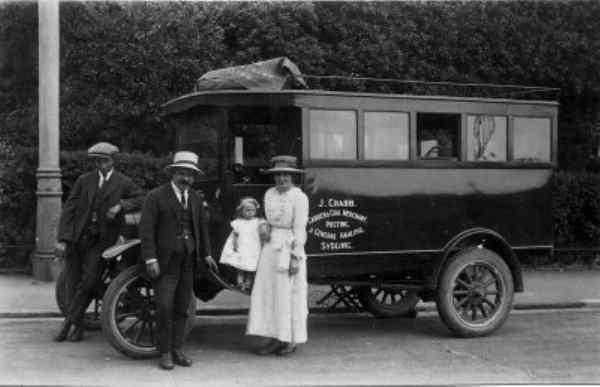 A proud Jimmy Crabb with his first motor bus, wife and baby daughter. As years went by the first vehicle was replaced in 1929 by another Ford TK3338, painted light blue with seats for 14 passengers. This was to give nearly twenty years service and lasted the Crabb's through the Second World War before it had to be replaced in 1948. Then a 20-seater Dennis Ace was bought from another old-established local operator, House of Hilton. This was RV6946 and it had a small protruding snout-like bonnet with small wheels set back, which led to the model being commonly known as "The Flying Pig". Although the body was in poor condition it was refurbished by Tilleys of Dorchester and was then fit for further service. Market days saw the bus starting from the Cross Tree, at the bottom of the village, the traditional gathering point for passengers. In an epitome of the service provided by country carriers to their customers, Mrs Nellie Crabb would have toured the village beforehand taking orders for shopping and errands for those who could not travel. She then acted as conductress on the bus, which loaded with all sorts of produce and livestock (rabbits, poultry, young calves) as well as the passengers, went into town twice on Wednesdays, with one round trip in the morning and another in the afternoon. On Saturdays it was a similar pattern but a later journey catered for those wishing to go the "pictures". On market days Mrs Crabb was very busy whilst in town. Produce and livestock had to be taken to the market and if there were a lot of eggs they had to be taken out of the travelling boxes and placed in the auctioneers own containers. This was a time consuming job. When this was done she went round the shops selecting items for those who couldn't get into town. Every conceivable item from clothing to foodstuffs, ironmongery to timber was brought back to the village in the bus. In the 1920s, when carriers and other traffic thronged the streets of Dorchester, the council decided that something had to be done to ease the congestion. A yard in Trinity Street belonging to the council was made available free of charge to the carriers and most of them, including Crabb’s bus, used this as a parking ground, although still calling at their traditional inns and at the railway stations to collect items left there for delivery. As well as the regular bus service, outings for the villagers, and for the local Sunday Schools and other organisations, were organised to the seaside at Weymouth (usually the first choice), to Bournemouth or to the Military Tattoos held at Tidworth on Salisbury Plain. These rare treats were eagerly anticipated and greatly enjoyed - whatever the weather. 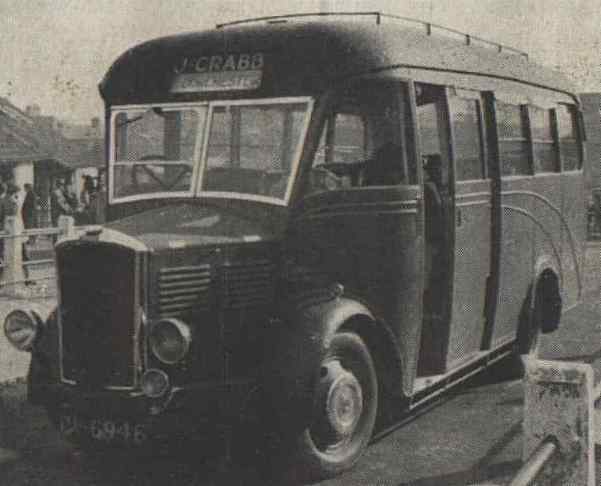 When not needed for passengers, the bus was used on Mr Crabb's coal round. With seats folded away or removed it was loaded with bags of coal which were carried up cottage paths and tipped into coal houses. Family members recall that Tuesday and Friday nights were bus cleaning nights, when all the family got together to brush the floor and clean the windows, removing all traces of the black dust and ensuring the vehicle was fit to take people again! The other village bus service in Sydling was first run by the Terrell family. Henry Frederick Terrell also farmed some land at Dollans Farm as well as being involved in transport from as early as 1903. It is thought he bought his first motor bus in 1920, FX5484, a plum coloured 30hp Selden with a body apparently built by Pitfield's, the Sydling builders, in the City Barn which used to stand on the site of the green. In 1929 this was replaced by a Morris 13-seater TK2996, painted brown. A 1934 Commer 20-seater YD9487 followed in 1944. Henry's son Fred took over the business, but sadly he died in 1946 at the early age of thirty four. The family decided to sell the business and the buyer was Albie Lovell, who had been Crabb’s driver for over thirty years. Albie had married a Miss Vida Dubben, whose family had been the village bakers in Sydling until 1935. They had enough capital to purchase Terrell’s service and so Albie left Crabb's to become the owner of the other service. He is remembered fondly as quite a character, always wearing polished gaiters, and rushing round Dorchester on market days doing errands. Albie was also renowned for the fact that his Commer bus YD9487, which Mr Terrell had bought from Legg’s of Evershot in 1944, had poor brakes and, as a result, usually ran back into the wall at the bus park in Trinity Street. From Sydling St Nicholas - Wednesday: Lovell - 10.00, 1.30, 4.30. Crabb - 10.15, 1.45. Returning from Dorchester - Wednesday: Lovell - 12.15, 2.45, 5.10. Crabb - 12.30, 4.00. From Sydling St Nicholas - Saturday: Lovell - 10.00, 1.00, 6.00. Crabb - 10.15, 1.00, 6.00. Returning from Dorchester - Saturday: Lovell - 12.30, 4.30, 9.30. Crabb - 12.00, 4.00, 9.00. Jimmy Crabb died in 1950 at the age of 67 but his wife Nellie continued the bus service until 1952. After a short period of joint operation the proprietors of both the Sydling firms agreed a sale of their routes to Ivor Collins of Pearce & Co. of Cattistock. The new owners merged the two services and extended them to Up Sydling, a hamlet which had never before had a bus service. But it was a friendly arrangement as on Saturdays the Pearce drivers waited at Sydling from half past four, when they arrived with the shopping bus, until 6pm when the "picture bus" departed and they usually spent their layover time having a cup of tea with the Crabb family ! Pearce's were to serve Sydling for nigh on forty years. With the changes of the late 1980s after deregulation of buses in 1986, followed by Pearce's withdrawal from bus and coach operation in the area after closing their Cattistock garage in 1990, Sydling St Nicholas was served in the main by a couple of journeys diverting and double-running off the Dorchester - Sherborne 216 bus route at Cerne Abbas, rather than the traditional route down the valley through Magiston and Grimstone. Since 2004 Sydling had only one bus on a Wednesday service to Dorchester and Weymouth that comes through from Broadwindsor via Evershot and Holywell as First route 213 - but it did follow the valley road through Magiston again. That lasted until 5th November 2008 and then Sydling was left without any bus service. In order to maintain some access from the village for shopping and other purposes, the county council introduced a taxi scheme to take residents into Dorchester. On Wednesdays (except public holidays) starting from Wednesday, 12 November 2008, a four-seater taxi leaves Sydling at about 10am and returns from Dorchester at about 1pm. The taxi needs to be pre-booked at least one hour before departure time by ringing Bob's Cars taxi service. Any pre-booked passengers can be collected from the following locations in Sydling St Nicholas: • Chapel Cross • The Greyhound • Bus Shelter and will be delivered to Trinity Street, Dorchester. The return journey departing from Bob's Cars taxi office in Trinity Street.